WASHINGTON (CN) – A leaked transcript of President Donald Trump’s January phone call with Mexican President Enrique Pena Nieto shows Trump asking that the Mexican leader stop publicly denying his country would pay for Trump’s proposed border wall. The transcript of the call, which lasted nearly an hour, was published by the Washington Post on Thursday morning and shows Trump and Pena Nieto discussing trade, the border wall and each country’s efforts to combat drug trafficking and violent crime. Trump asked Pena Nieto in the Jan. 27 call to stop telling the media that Mexico would not pay for Trump’s proposed wall along the U.S.-Mexican border, saying it was hurting him politically. Trump told Pena Nieto that the wall “is the least important thing we are talking about,” but that it had nevertheless been a central theme of his successful campaign. Trump spent a portion of the phone call telling Pena Nieto about his electoral victory and recounting the size of his rallies on the campaign trail. He told Pena Nieto that without the promise to build a wall he would not be in the oval office. Pena Nieto suggested that economic growth would be better than any wall Trump could build and asked Trump to help hammer out a “more fair trade relationship” with him. “Let me tell you that the best virtual wall that I think we can build between our two countries is to make sure that both countries have economic development,” Pena Nieto said. Trump also pushed Pena Nieto on the issue of drugs coming from Mexico into the United States, saying he won states like New Hampshire, which he called a “drug-infested den,” because of his stances on drug trafficking. New Hampshire Sen. Jeanne Shaheen, a Democrat, on Thursday demanded Trump issue an apology for his comments in the call. 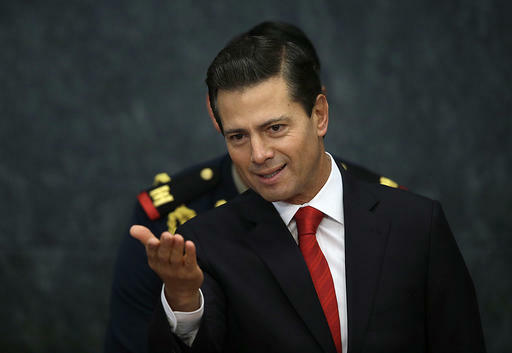 Pena Nieto agreed that organized crime is a problem for both countries, but reminded Trump that many Mexican criminal organizations are funded and armed with money and weapons from the United States. The Washington Post also published a transcript of Trump’s call with Australian President Malcolm Turnbull on the same day that shows the exact details of a call that was described as unpleasant in reports in January. Trump and Turnbull discussed a deal, made under the Obama administration, that committed the United States to taking in economic refugees Australia had blocked from entering the country under an immigration policy that prevents refugees from coming to the country by boat. Trump was reluctant to accept the deal, saying it would make him look like a “dope” because of an executive order he had just signed blocking refugees for 120 days as well as immigration from seven Muslim majority countries. Turnbull pressed Trump to remain true to the deal and repeatedly corrected him on its details. Trump seemed to grow frustrated by the end of the call, complaining that it was the worst in a string of calls to foreign leaders he made that day.